Walthew House is an independent local charity, supporting people in Stockport who are blind, visually impaired, deaf or hard of hearing, or who have dual sensory loss. 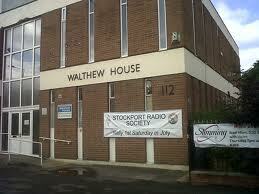 Stockport Radio Society moved its headquarters to Walthew House in April 2009 from its previous base in Bramhall, on the edge of the borough. The society now holds all its regular meetings, training course and July rally at the venue which is located in Shaw Heath, close to the centre of the town, local and national public transport and major road networks. Walthew House is close to the centre of Stockport and is easily accessible by public transport. Stockport’s train station is a short 10 minute walk away. Public transport stops outside Walthew House. Check the TfGM website to plan your route. The main A6 trunk route is a 5 minute walk away and bus routes from further a field including Manchester, Macclesfield, Wilmslow and Buxton will stop within easy reach of the venue. TfGM‘s journey planner will plan your route for you. If you intend to visit Walthew House by public transport, we recommend you consult the TfGM website, where details of local busess, trains and trams can be found. The venue is on the south side of the town centre and is in the same general area as Stockport County’s Edgeley Park Ground and Stockport College. For those travellers using satellite navigation linked to post codes, we would advise you to exercise caution. Whilst the postal code for the venue is SK2 6QS, this covers a large portion of Shaw Heath which is a long road and using this in isolation may put you at the wrong end of the road. So, please note, the address for the venue is 112 Shaw Heath, Stockport. SK2 6QS which is close to the junction of Shaw Heath with Longshut Lane West. A couple of other notable landmarks, which are close by, are The Florist public house and Harry Bates bathroom showroom which is next door. There is limited parking at the venue, for upto 12 vehicles, which at the rally will be allocated to traders and disabled drivers. Car parking facilities are available in the area, including both street side, and dedicated car parks a short distance away, and others within a 15 minute walk. Most of these are free, however please be aware some are pay and display. If parking on the street, please take care to view any parking signs, so as to be aware of any time restrictions. Stockport Radio Society ask that you park carefully, to ensure that there is no obstructions in the area around Walthew House as this is mainly residential. We recommend that, prior to setting out, that you visit parkopedia’s website, and search using the post code ‘SK2 6QS’. This will highlight parking facilities in the area and also a map to show how they can be reached. Arriving from the west by M56, then M60 and north around the west side of Manchester by the M60 – leave M60 at Junction 2, which is signposted Cheadle A560, At the roundabout, known locally as Roscoe’s roundabout, follow A560 towards Stockport passing through a pedestrian crossing, then a Tesco Express on the right hand side. At the next set of traffic lights, the Farmers Arms public house is opposite, turn right into Edgeley Road (B5465). Passing Terrys Fabrics store on the left hand side and school on the right hand side, you will then arrive at a roundabout with a Morrisons superstore on the left hand side. Continue across the roundabout, then a railway bridge and through a pedestrian crossing, with the Railway Social Club on the right hand side. Edgeley Road (B5465) then bears left at a set of traffic lights and begins to climb passing the Wycliffe Villa Hotel on the left hand side then Alexandra Park on the right hand side, as the climb levels out. Reaching a set of traffic lights, Edgeley Library is on the right hand side, continue straight ahead with the road, which now becomes Mercian Way, as it bears right through a pedestrian crossing. Stockport County’s Edgeley Park stadium is visible on the right hand side as it the Stockport Telescope and Binocular Shop. Continue Straight ahead through a set of traffic lights, then on reach the next set of traffic lights, with The Florist public house and Harry Bates Bathrooms store on the right hand side, bear right through the lights and the venue is on the right hand side. Arriving from the east and north around the east side of Manchester by the M60 motorway – leave the M60 at Junction 1, which is also the Pyramid Junction. Arriving at the junction roundabout, be in the left hand lane and take the first exit to the left, signposted A560 to Cheadle. Passing through the 1st set of traffic lights, you quickly arrive at a 2nd set, which is a T junction. The Woolpack public house is on the right hand side. Turn left into Chestergate which is the A560 and is a two lane one way road. Passing industrial and commercial buildings on both side, and with the road shortly bearing to the right, move into the right hand lane. The road arrives at a junction with the railway viaduct visible in front of you, and in front of that is the Stagecoach Manchester bus garage. Whilst this is not a T junction, normal traffic can only turn left and right. Be in the right hand Lane and when able turn right. Arriving at another set of traffic lights, with the bus garage on the left hand side and the Comfortable Gill on the right hand side, proceed through the traffic lights passing an Indian restaurant, then the fire station on the right hand side and another part of the bus garage on the left hand side. The road climbs and eventually bears to the left passing the Old Vic public house on the right hand side and the Edgeley entrance to the Stockport station on the left hand side. With the road levelling out, you approach a roundabout which is known locally as the Armoury roundabout. Take the second exit with the Armoury public house on the left hand side. Be careful, as there is a pedestrian crossing outside the pub. The road is the beginning of Shaw Heath and is still numbered B5465. Continue straight ahead through a set of traffic lights then on reaching the next set of traffic lights, with The Florist public house and Harry Bates on the right hand side bear right through the lights and the venue is on the right hand side. Arriving through Manchester from the north visitors to the rally should aim to do so on the main A6 trunk road which passes through the centre of Stockport and onward towards Hazel Grove, High Lane, Disley and beyond. Reaching the centre of Stockport with Debenhams department store on the left hand side and the George public house and railway viaduct visible on the right hand side, continue along the A6 past Mersey Square with the Plaza Theatre visible on the left up the hill through two sets of traffic lights, the first with Stockport Central library on the left to the second with a McDonalds restaurant on the right then to the third with the Town Hall on the left hand side. At this time aim to be in the right hand lane as at the fourth set of lights with the Nelson public house on the right hand corner and Stockport Art Gallery opposite you will need to turn right dissecting the two. Turning right into Greek Street with the art gallery on the left hand side & Nelson on the right hand side you will soon pass on the left Stockport College with it’s car park, which may be an alternative if all others are full. Continue down Greek Street until reaching a roundabout known locally as the Armoury Roundabout. Take the first exit with the Armoury public house on the L/H side. Be careful, as there is a pedestrian crossing outside the pub. This road is the beginning of Shaw Heath and is still numbered B5465. Continue straight ahead through a set of traffic lights, then on reaching the next set of traffic lights with The Florist public house and Harry Bates Bathroom store on the right hand side bear right through the lights and the venue is on the right hand side. Arriving from the South from Macclesfield, Buxton, Disley, High Lane, Hazel Grove and beyond again please do so along the main A6 which passes through the centre of Stockport on it’s way into Manchester and beyond. After passing Stockport Cemetery and Crematorium on the right hand side and St Georges church with a very big spire on the left hand side, you’ll arrive at a junction with the Blossoms public house on the left hand side. Continue through the traffic lights still on the A6 and passing a flower shop on the left hand side. At the next set of traffic lights, just after passing a paint shop on the left hand side turn left into Longshutt Lane West (B5465). There is a car showroom on the right and right hand side as you turn. Continue down Longshutt Lane West until the next junction. At the traffic lights you will see Harry Bates Bathroom store in front of you with Walthew House, the venue, next to it on the left. Turn left at the lights. Arriving from the east and north around the east side of Manchester by the M60 Motorway but leaving at Junction 26 – on arriving at the Portwood roundabout the watch word if this is the first time you have used this roundabout is be careful. Take care to notice the traffic lights that are applicable to your lane. Leave the roundabout and take the 2nd exit which is signposted Marple A626 and is named St Mary’s Way. Passing a couple of car showrooms, including Citroen and Vauhall and an old mill on the left hand side and a Dunelm furniture store on the right hand side continue through the next set of traffic lights, the road then bears to the right and climbs and levels out at a junction where you should continue straight ahead. There is a West Way Nissan showroom on the right hand corner and turning left would take you to Marple an the A626. The road, now the B5465 Hempshaw Lane is lined on both sides by car showrooms of varying manufacturers. Passing through a Pedestrian crossing, passing County Motors on the left hand side in right hand lane to go straight on you will quickly arrive at another set of traffic lights with The Flying Dutchman public house on the left hand side continue straight ahead. At this point be careful as to which lane you need to be in as at the next junction, which is the crossroads with the A6, you will need to carry straight ahead. After crossing the A6, still on the B5465 you now enter Longshutt Lane West. At the next set of traffic lights you will see Harry Bates Bathroom store in front of you with Walthew House, the venue next to it on the left. Turn left at the lights.